The leftover pork and bread from last night and the small packet of instant coffee from Maura with microwave water at the albergue provide the basic fuel for the 17 km to Valdestillas today. That and the two oats bar. Funny how Maura took the coffee from the hotel on her transit in Dublin to Madrid since she is abstaining from coffee for Lent. Less walking on the pine forest trails today and more dry thirsty Spanish landscape. Past 11 am after 17 km in Valdestillas to have my first proper coffee for the day. Also a cheese sandwich and even a chocolate ice cream cone. I normally don't take sweet stuff these days but on the Camino anything goes. Weather turns warmer after we left the town. It's slowly getting warmer the last few days but morning is still cold at 7 degrees. The next 9 km was bad, mainly along the road or bad stony trail besides it. 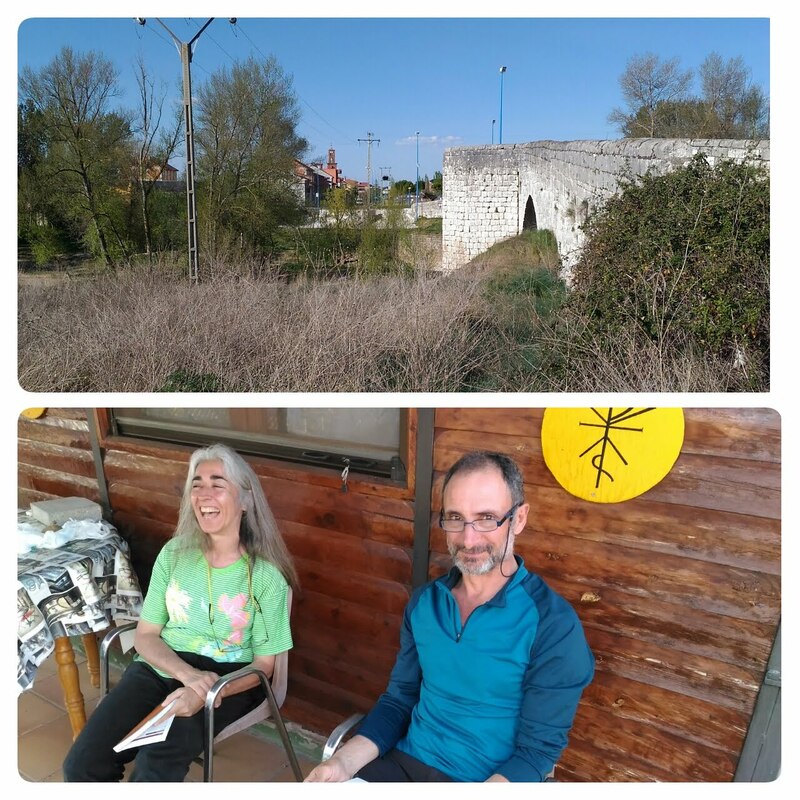 Finally arrived in Puente Duero just after 2 pm. This time only Maura and me at the bar just before the bridge (obviously from the name of the town). The river Duero is small here, it gets bigger in Zamora (Camino via de la Plata) then I think it goes out to sea in Portugal. 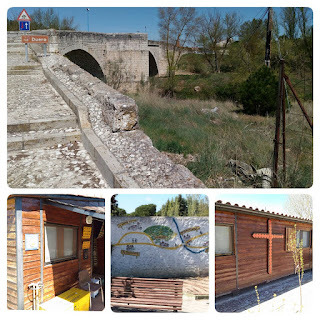 The sign before the bridge says albergue left and the Camino across. At 2:30 pm and we decided to go to the albergue and just wait outside until it opens at 3 pm. Just our luck we bump into the hospitalero. 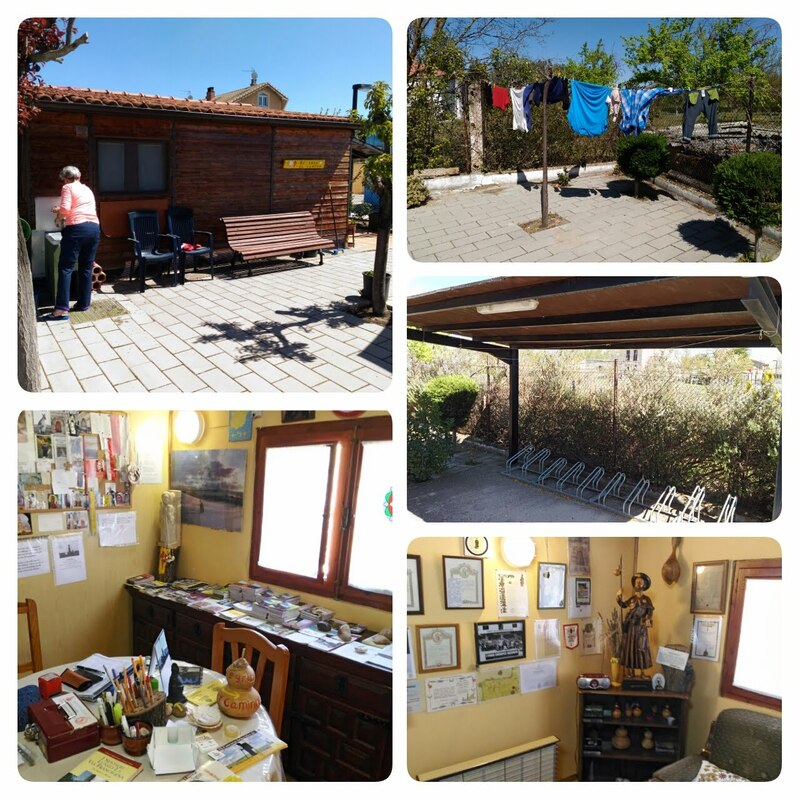 Beautiful Albergue run by the association of the friends of the Camino. 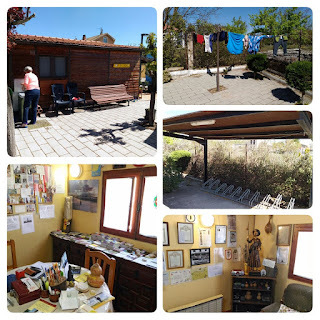 A perfect albergue for pilgrims. Kitchen, outside wash point, mural of the Camino Madrid with big open spaces to sit listening to the birds, nice living room with compact Camino guides for many other different Caminos, some even in French or English. If it rains there is a cloth line just below the shelter for the bicycle (bici-peregrinos). Only thing is there are just 2 rooms with 4 beds each. Sandro came in next, then Ivan. We decided to take a room for the four of us with Maura and Sandro at the bottom bunk and Ivan and me at the top. It's already tested that the four of us don't snore at night. Last evening was to out in a good way hard to sleep. The big Spaniard Miguel came in next. He walks fast with a small backpack (just sleeping bag?) and two hand carry bags in both hands. The couple Manolo and Victoria took their time and arrived much later. They will walk less tomorrow so will this will be their last day with us. It's easy for them from Madrid to walk a week and come back anytime to continue. 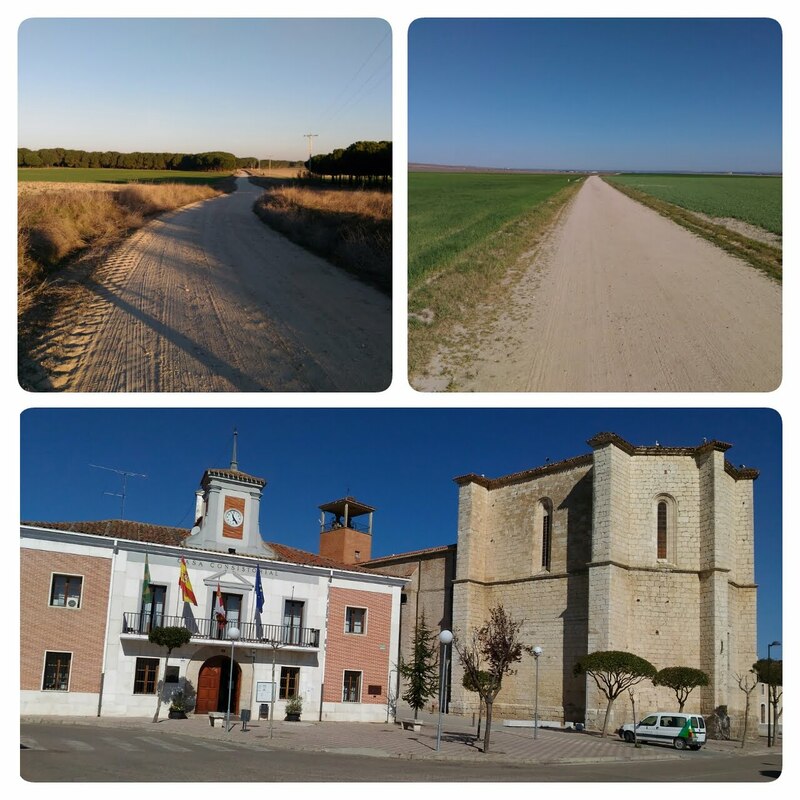 Ivan left later in the evening by bus to Valladolid 7 km away to buy a new pair of shoes. His current one is in danger of splitting and better chance of finding a good one in a big city. The Camino does not go through Valladolid but skirts to the left of the city. In the evening after shower, wash and rest we went across the bridge to town. 3 more bars there and no supermarket, just a tienda. It would have to do. Dinner later at one of the bar.